Have you attended one of Lisa’s programs, visited The Gardener’s Workshop booth or followed along with her virtual book study? We’d love for you to share your experiences here! View reference letters click here. Just heard you for the 3rd year in a row at the MENF in Belton, TX. Always encouraging to hear you speak. I just ordered some Biofilm 360 and organic grow mix. I wasn’t as successful with mixing my own, but after seeing your video again I may have not used enough water to mix it. I plant in mostly 4’x4′ raised beds, so the 4′ wide Biofilm 360 will work nicely. Thanks again for speaking at the MENF. I was completely enthralled with both sessions that Lisa presented last Saturday…practical approach, understandable and useful information and fun to boot! I usually get fidgety after a couple of hours of talking but would have gladly sat through a third session! Thank you! I placed an order this morning and intend to be a frequent flyer on your website! I just wanted to say that I thoroughly enjoyed your online course on Seed Starting Made Easy and The Easy Cut-Flower Garden. I live in Ontario Canada and I am really looking forward to starting my 2nd year of Flower Farming. I got a lot of good pointers from your course and will definitely be putting them to use this season. Dawn, thank you so much your kind words! I’m glad the courses helped. I just attended the Small Farm Cut Flower Conference in Danville, VA. I had the honor of attending two sessions that Lisa conducted and getting to hear her as a keynote speaker on the first day. I cannot express to you in words how wonderful Lisa is at speaking and sharing her knowledge. She was nice and kind, full of information had hands on demonstrations, videos, added humor to her presentations, answered any questions thrown at her and still stayed on track to finish everything that she set out to teach us.. I would highly recommend her “Cool Flowers” book and I would not hestiate to buy anything that she has written. The “Cool Flowers” book is also like a pocket guide or reference guide that you will be sure to use for years. Thank you Deanna for your kind words! I went to Lisa’s workshop at the Mother Earth fair in Topeka. Her class was the highlight of the 2 day event for me. I learned a lot and loved the way her passion shows through her practical teaching style. I bought her book and will be using the knowledge as I begin flower farming on our new acreage this coming year. Thank you, Lisa for sharing this wonderful information. My husband and I attended the Mother Earth News Fair in Topeka, Kansas on Oct. 21 and 22. When I saw that there was going to be a speaker for cut flowers, I became very excited for the fair. I had been considering starting my own cut flower business and listening to Lisa’s first talk about it really inspired me, as well as my husband, to go through with this. I enjoyed Lisa’s Cut Flowers 101 session so much that I went to the fair book store right after to buy two of her books that were available there. My husband and I also decided that we wanted to attend her next talk, Vegetables Love Flowers, as we have recently started a vegetable farm and wanted to know more about how flowers could positively impact this. Let’s just say after both of these sessions my husband and I were astonished with the new knowledge we had gained. I would defiantly go to another one of Lisa’s speaking sessions. I attended the Mother Earth News Fair in Seven Springs, Pennsylvania this year. It was an awesome experience and I really look forward to going again. One of the seminars I attended was Cut Flower gardening presented by Lisa Mason Ziegler. This seminar was by far my favorite! Lisa’s enthusiasm and her passion for flowers is clearly evident and infectious to those around her. Her knowledge speaks volumes as to her dedication in her field. Lisa is such a likable person and readily shares her experience and time. Thankfully, I got to her seminar early, as there literally was standing room only….reaching out into the hallway! I definitely will be seeing her again next year and ask of you to please give her a bigger room to present her teachings. Everybody wanting to see her deserves to be in her presence! Lisa, my sister and her two grandchildren visited the Open Farm on the 24th. (our third year) As usual, we enjoyed your presentation thoroughly. We purchased some seeds, a fresh bouquet, some candle vases(can’t wait to try these), Babs the Farm Dog book and stuffed toy, and some tools for weeding. We have used your soil blockers that we purchased last year and have been thrilled with the results. I also use the 3 bucket flower container weekly when I purchase or cut fresh flowers. We were happy to meet Beri, your new Farm Dog-what a treat for the grandchildren! I repeatedly view and enjoy your excellent videos, especially the ones with instructions about soil blocking and cutting zinnias. Your sister Suzanne, is also delightful and very helpful with the shopping. Please pass on our thanks to her as well. Lisa, you are an inspiration to so many gardeners. Your passion is heartfelt and contagious! I hope to see you soon at an upcoming show or convention. In the meantime, I will think of you whenever I harvest my zinnias. I have to remember to “go deep”! Just attended the National Garden Club Convention in Richmond and Lisa’s seminar was my favorite. My husband and I are bee keepers so organic gardening is a must! Her information, enthusiasm and willingness to share her knowledge with her audience made her #1 in my book. Can’t wait to use my seed blocker and seeds I purchased! 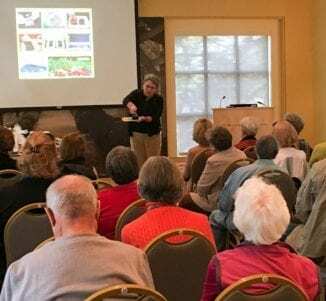 Her DVD and program offer will hopefully offer important information to our new club members and seasoned gardeners alike! Thanks Lisa! If ever you have an opportunity to hear Lisa speak, take it, you will not be disappointed!! Lisa, thank you so much for coming to Kansas City to do a talk about your gardening insights, lessons and best practices! I learned a lot from your presentation and I’m eager to try your soil blocking method (as well as other methods you use in your flower farming). Thanks again for making the trip and taking the time to share your experience and knowledge with us! My husband and I saw you at the Mother Earth News Fair in PA a couple of years ago. We use the soil blockers we purchased that day from you and love them. I have ordered hand tools, seeds and books. Y’all are very prompt in filling orders and all products have been great! The books are so helpful as are the e-newsletters. I received so much truly helpful information at Lisa’s lecture on seed starting. I had given up on ever being able to grow my own seedlings but now feel confident I can do this! From seed slayer to seed grower, thank you!! We attended the M.E.N. Fair in Belton TX. Lots of good folks presented on the subject of chickens, worms, and veg gardening; only Lisa presented on flowers. She made several good points for any small homestead business, and much good info about flowers. Because nobody eats flowers from the florist, perhaps flowers could be grown on the leach field for our septic system. I just would not eat a carrot grown there! HA I have been looking for a system to recycle the nutrients. Lisa, Thank you for everything you do for us. Your videos are amazing. I learn something new every time I reread your books or watch a video. I am starting out tiny so your methods are perfect for my flower farm business. The enthusiasm that Lisa brought to the January 25th workshop in Petersburg, Va was contagious. I talked nonstop to my husband on the way home to Pa and got out in my garden to weed my cool flower garden the next day. I feel that if you follow Lisa’s practical advice there is no way you wouldn’t be successful in flower farming. A must for me is to use her Cool Flowers book as a bible. Thank you for spending the time to share all this knowledge. I have been trying to figure out a way to extend my season (zone 6, I will let you know how it goes) for several years, and this has given me a lot of info to work on. I just ordered the book, can’t wait to get it! Thanks again. Thanks so much for the time spent giving all this info! I have been trying to figure out how to extend my season for several years now (zone 6 – I will let you know how it goes), and this has given me some ideas. I just ordered the book, can’t wait to get it. Thanks again! Lisa gives down-to-earth (pun intended! ), sound gardening advice with irresistible enthusiasm that makes everyone want to run out and till up at least a small plot of land. Her encouragement and knowledge will lead novices to their first gardening successes and experienced gardeners to hone their skills. Reading her words is one level…actually hearing from her and talking with her is pure gold. If you want to succeed with growing, then look no further – Lisa brings her years of experience to help you grow the best plants and flowers efficiently and well. We had been frustrates by our attempts to grow spring flowers in our hot Southwestern climate, but with Lisa’s explanations and expertise regarding the “cool” flowers, we are having smashing success! I have attended several of Lisa’s presentations over the years and they are wonderful. She is knowledgeable, charming, and really fun to learn from. Lisa’s talks at the 2016 National ASCFG conference were hands down my favorites! She is a dynamic speaker- full of information, wit, and charm. She provided great ideas about how to diversify a cut flower farming business and used her business’ successes and failures as relevant examples. I left with very tangible ideas on how to diversify my business further, with skills that I already have and can work to fine-tune. Lisa is a fabulous speaker who conveys solid information and wonderful enthusiasm. Whether you want to learn about seed starting, hardy annuals or a system for installing biodegradable plastic on flower beds, Lisa is the one to turn to for excellent tips. If you only have time for one gardening program a year, pick this one! Lisa shared all her secrets and has an incredible business model. You will not be disappointed.